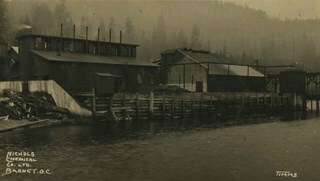 In 1925, William Kask Sr. and his family purchased land along the Barnet Road and built what became known as Kask's Camp, where cabins were rented out to families working at the Barnet Mill. 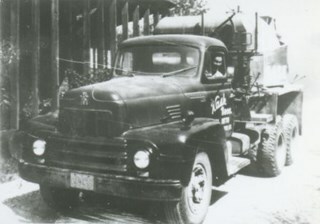 The family - William Kask Jr., Dave and Jack - went on to expand their business into a lumber and concrete supply company and in 1936, the company was named the Kask Brothers Building Supply Company. 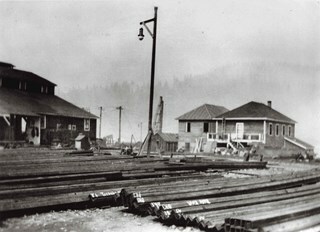 A lumber office was established on Curtis Street and the concrete plant was built at the former site of the cabin camp. 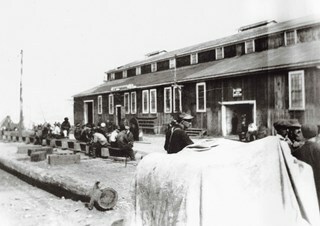 To a large degree, the camp catered to Immigrants from Nordic countries who were active in the lumber trade. Many Finns felt at home in the camp, as the Kasks spoke Finnish and there were steam baths available. Photograph of the headquarter buildings at the submarine works yard at Barnet. During World War One, the Royal Russian Navy contracted with a Seattle-based company to build submarines for Russia, but American neutrality in the war prevented the subs from being built in the United States. Instead, the company operated a facility at Barnet to complete the contract. Photograph of the headquarters of the submarine works yard at Barnet. During World War One, the Royal Russian Navy contracted with a Seattle-based company to build submarines for Russia, but American neutrality in the war prevented the subs from being built in the United States. 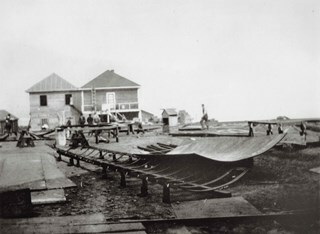 Instead, the company operated a facility at Barnet to complete the contract. Photograph of a large number of labourers (all unidentified) seated outside a building at the submarine works yard at Barnet. During World War One, the Royal Russian Navy contracted with a Seattle-based company to build submarines for Russia, but American neutrality in the war prevented the subs from being built in the United States. Instead, the company operated a facility at Barnet to complete the contract. 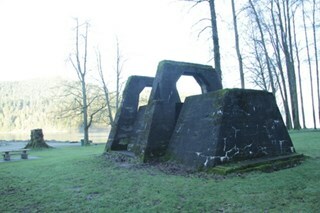 Photograph of a large building at the site of the submarine works yard in Barnet. During World War One, the Royal Russian Navy contracted with a Seattle-based company to build submarines for Russia, but American neutrality in the war prevented the subs from being built in the United States. 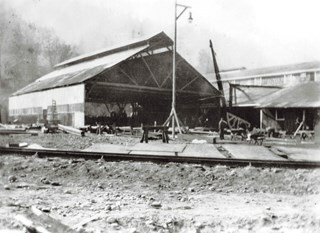 Instead, the company operated a facility at Barnet to complete the contract. 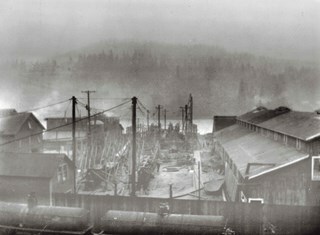 Photograph of the submarine works yard at Barnet in Burnaby. During World War One, the Royal Russian Navy contracted with a Seattle-based company to build submarines for Russia, but American neutrality in the war prevented the subs from being built in the United States. Instead, the company operated a facility at Barnet to complete the contract. 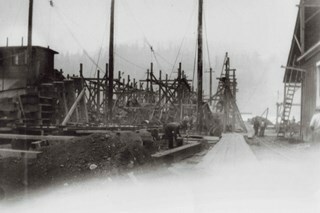 Photograph of scaffolding erected for the construction of submarines at the manufacturing site in Barnet, Burnaby. During World War One, the Royal Russian Navy contracted with a Seattle-based company to build submarines for Russia, but American neutrality in the war prevented the subs from being built in the United States. Instead, the company operated a facility at Barnet to complete the contract. 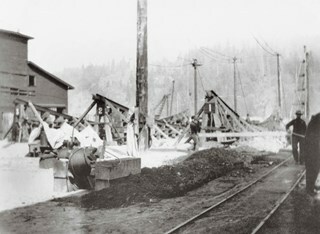 Photograph of labourers at the site of the submarine works yard at Barnet in Burnaby. During World War One, the Royal Russian Navy contracted with a Seattle-based company to build submarines for Russia, but American neutrality in the war prevented the subs from being built in the United States. Instead, the company operated a facility at Barnet to complete the contract. Photograph of a few labourers (all unidentified) at the submarine works yard at Barnet. During World War One, the Royal Russian Navy contracted with a Seattle-based company to build submarines for Russia, but American neutrality in the war prevented the subs from being built in the United States. Instead, the company operated a facility at Barnet to complete the contract. Photograph of the buildings and grounds of the submarine works yard at Barnet. During World War One, the Royal Russian Navy contracted with a Seattle-based company to build submarines for Russia, but American neutrality in the war prevented the subs from being built in the United States. Instead, the company operated a facility at Barnet to complete the contract. 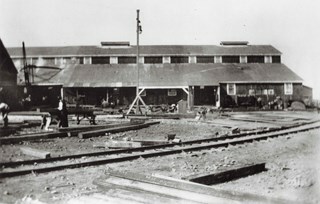 Photograph of the submarine works yard at Barnet. 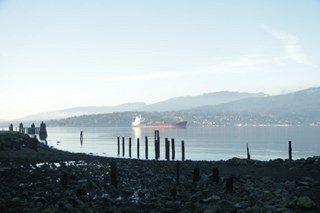 Visible in the photograph is the extensive system of scaffolding used during construction and to the right a building can be seen. During World War One, the Royal Russian Navy contracted with a Seattle-based company to build submarines for Russia, but American neutrality in the war prevented the subs from being built in the United States. Instead, the company operated a facility at Barnet to complete the contract. 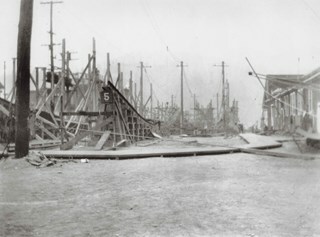 Photograph of the submarine works yard at Barnet. 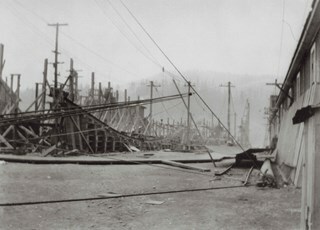 An extensive system of scaffolding can be seen with power lines running alongside it. During World War One, the Royal Russian Navy contracted with a Seattle-based company to build submarines for Russia, but American neutrality in the war prevented the subs from being built in the United States. Instead, the company operated a facility at Barnet to complete the contract. 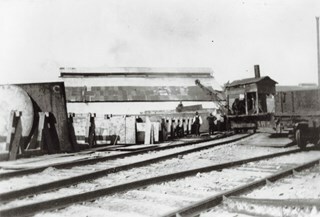 Photograph of five labourers moving a cart loaded with materials near the scaffolding in the submarine works yard at Barnet. Two other men can be seen standing to the right - all are unidentified. During World War One, the Royal Russian Navy contracted with a Seattle-based company to build submarines for Russia, but American neutrality in the war prevented the subs from being built in the United States. Instead, the company operated a facility at Barnet to complete the contract. 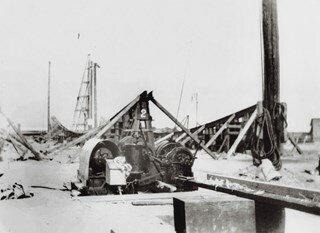 Photograph of some of the equipment used at the submarines works yard at Barnet. During World War One, the Royal Russian Navy contracted with a Seattle-based company to build submarines for Russia, but American neutrality in the war prevented the subs from being built in the United States. Instead, the company operated a facility at Barnet to complete the contract. 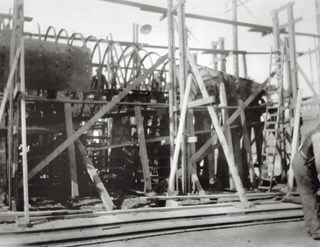 Photograph of the hull of a submarine suspended on scaffolding at the submarine works yard at Barnet. During World War One, the Royal Russian Navy contracted with a Seattle-based company to build submarines for Russia, but American neutrality in the war prevented the subs from being built in the United States. Instead, the company operated a facility at Barnet to complete the contract. 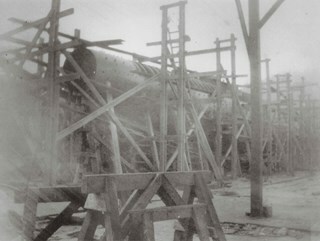 Photograph of scaffolding set up for the manufacture of submarines at the submarine works yard at Barnet. 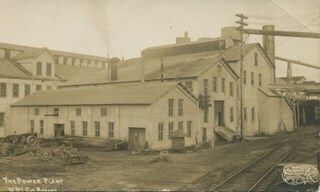 Numerous labourers and two industrial buildings can be seen in the background. During World War One, the Royal Russian Navy contracted with a Seattle-based company to build submarines for Russia, but American neutrality in the war prevented the subs from being built in the United States. Instead, the company operated a facility at Barnet to complete the contract. Photograph of approximately ten labourers working on the hull of a submarine at the submarine works yard at Barnet. All are unidentified. During World War One, the Royal Russian Navy contracted with a Seattle-based company to build submarines for Russia, but American neutrality in the war prevented the subs from being built in the United States. Instead, the company operated a facility at Barnet to complete the contract. 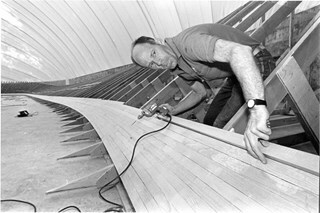 Photograph looking down the hull of a partially-constructed submarine being built at the submarine works yard at Barnet. During World War One, the Royal Russian Navy contracted with a Seattle-based company to build submarines for Russia, but American neutrality in the war prevented the subs from being built in the United States. Instead, the company operated a facility at Barnet to complete the contract. 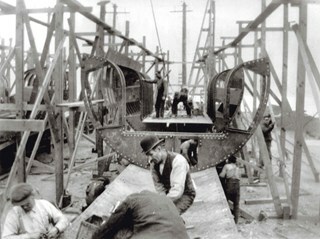 Photograph of labourers standing inside the steel ribs of what would become the hull of a submarine being built at the submarine works yard at Barnet. During World War One, the Royal Russian Navy contracted with a Seattle-based company to build submarines for Russia, but American neutrality in the war prevented the subs from being built in the United States. Instead, the company operated a facility at Barnet to complete the contract. 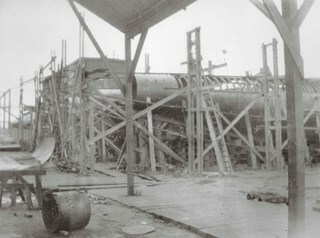 Photograph of a submarine under construction at the submarine works yard at Barnet. During World War One, the Royal Russian Navy contracted with a Seattle-based company to build submarines for Russia, but American neutrality in the war prevented the subs from being built in the United States. Instead, the company operated a facility at Barnet to complete the contract. 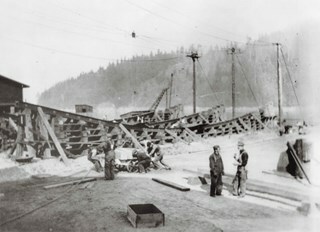 Photograph of the hull of a submarine suspended on wooden brackets. 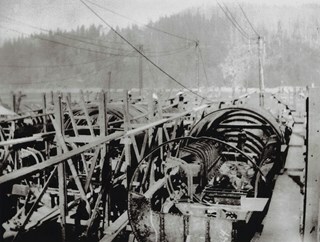 An unidentified labourer is discernible standing near the centre of the hull while another is partially visible to the far right. During World War One, the Royal Russian Navy contracted with a Seattle-based company to build submarines for Russia, but American neutrality in the war prevented the subs from being built in the United States. Instead, the company operated a facility at Barnet to complete the contract. 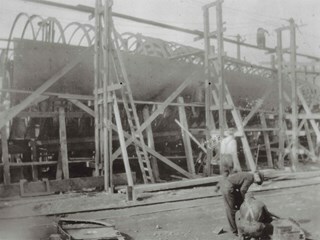 Photograph of three unidentified labourers working around the hull of a partially-completed submarine at the submarine works yard at Barnet. During World War One, the Royal Russian Navy contracted with a Seattle-based company to build submarines for Russia, but American neutrality in the war prevented the subs from being built in the United States. Instead, the company operated a facility at Barnet to complete the contract. 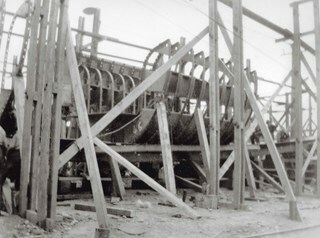 Photograph of a partially-completed hull of a submarine being supported by wooden brackets at the submarine works yard at Barnet. During World War One, the Royal Russian Navy contracted with a Seattle-based company to build submarines for Russia, but American neutrality in the war prevented the subs from being built in the United States. Instead, the company operated a facility at Barnet to complete the contract. 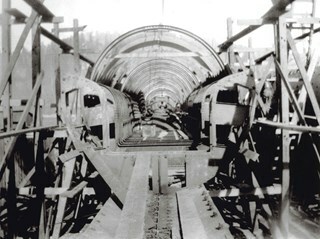 Photograph of a submarine's hull under construction at the submarine works yard at Barnet. During World War One, the Royal Russian Navy contracted with a Seattle-based company to build submarines for Russia, but American neutrality in the war prevented the subs from being built in the United States. Instead, the company operated a facility at Barnet to complete the contract.